Sherlock: The Abominable Bride – Spoiler-Filled Review | Warped Factor - Words in the Key of Geek. Festive Sherlock was anything but abominable, says Tony. In the run-up to the broadcast of The Abominable Bride, there was one central question surrounding it – the question of motive. The very essence of the Cumberbatch-Freeman Sherlock is that it takes the original stories set in the nineteenth century and gives them a modern twist, proving that Holmes and Watson, like only a handful of archetypal characters in the history of literature, can exist anywhere. Elementary after all has them existing not only in the twenty-first century, but also in America, and they work there too. Two hundred years from now, Holmes and Watson will be on Mars. Five hundred years after that, they’ll be somewhere else entirely that we can only guess at – while simultaneously existing at every other point since their original creation. 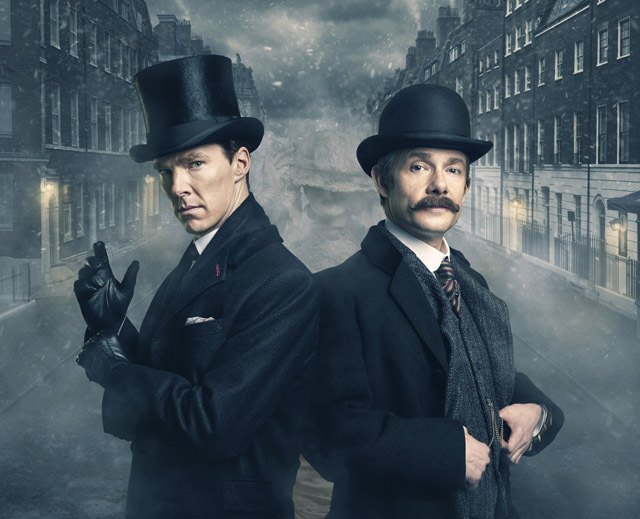 So if the point of the Cumberbatch-Freeman Sherlock is to deliver a modern day Holmes and Watson, then why, why, why above all would we suddenly be going back to the original Victorian setting? Yes, the images looked wonderful, and it was in the festive period where things would be forgivable that might not fly at any other point in the year, but really, isn’t going back to the original time period a sign of inspiration-failure? No. As it turns out, in the right hands it’s a stroke of forward storytelling genius. Let’s deal with the central thrust of the episode first – Cumberbatch, Freeman et al playing the Victorian counterparts of their roles in the modern Sherlock. If you stopped yourself asking why this was happening, it was joyous simply to see this modern crew strutting about in Victorian gear. Cumberbatch with slicked-back hair looked impossibly lean, a man haunted by the constant pressure of thought and little concern for his own welfare, giving us a younger traditional Holmes than we’re perhaps used to. If anything, he was less explosive than expected, but that’s probably subjective bias from a Jeremy Brett fan creeping in (So shoot me – if you’re going to go traditional Holmes, I’ve yet to see any evidence that Brett can be beaten). Freeman though continues to impress wherever he’s put – his nineteenth century Watson felt as real almost instantly as his twenty-first century incarnation. In that though, he was almost alone – the writing of the Victorian crowd didn’t seem to give the actors quite enough points of difference to build a unique performance on, Rupert Graves’ Lestrade looking like he was in Scotland Yard’s amateur dramatics group and wasn’t entirely comfortable about it. The notable exceptions to this sensation besides Freeman were Louise Brealey as Molly Hooper and Mark Gatiss as Mycroft Holmes, both of whom were aided by significantly more prosthetics than Freeman’s moustache. Nevertheless, the regular cast were more than acceptable, they were all actively enjoyable in their Victorian versions. The story itself as a Sherlock Holmes mystery was deliciously gothic: bridezillas killing evil men from beyond the grave – yes please, and by the bucketful. The twist was the point at which it became something beyond a festive bit of frightening fun though – that moment when Sherlock said “How did he survive?”, synapses flared across the watching world, and many of us thought “Ohhh, I know what this is. He’s going deep, of course he is…” To the credit of the Production Team, this one wasn’t bizarrely unfathomable, it was invitingly logical. You could almost sleuth-along-a-Sherlock, from the obvious – “That’s Molly!” – to the rather more pleasingly obscure – “There’s no way she’s a maid” – to in fact the crunchier point of who killed Sir Eustace Carmichael (an effective if relatively – ahem – short-lived appearance by Tim McInerny), and that made it all the more joyous when Moriarty turned up. Let’s be honest though – any episode of Sherlock in which Moriarty turns up is extra-specially joyous, simply by virtue of the combination of what he represents to Sherlock (a point viciously and beautifully driven home in this episode), how he’s written in the modern series, and Andrew Scott’s insane and wonderful choices as an actor, that make him rarely predictable. This was no exception to Moriarty’s First Law Of Additional Joy, and will likely go down in the annals of Sherlock as one of the better episodes, for all initial reaction seems split on it. Once you knew what was really going on – the Victorian Sherlock as a problem-solving exercise in modern Sherlock’s head to answer the real and modern problem of how Moriarty could be both dead and back on every TV screen in the country – The Abominable Bride did the thing that it needed to do: it became about more than just delivering a festive gothic Victorian romp. It had a purpose, a point that took Sherlock’s contemporary story forward, while at the same time still being a festive gothic Victorian romp. It pleased those who have wanted the modern Sherlock to be more like the original, while also satisfying those of us who needed it to be rational, needed it to advance the story from where we left modern-day Sherlock. You could certainly argue that perhaps there were one or two too many flips between the classic and the new version of Holmes, and while I wouldn’t fight you on that point, it might be difficult to prove that those jumps back and forth actively harmed either the storytelling or the story. While in the Victorian arm of the story, she wasn’t given much with which to shine, it was great to see a new character-dynamic emerging for Amanda Abbington’s Mary in modern-day Sherlock too, contradicting the smug but increasingly sentimental Mycroft by for instance cracking MI5 security on a smartphone in the time it took him to explain how high his access went. In terms of an evolving ‘Scooby Gang’ surrounding the Great Detective, Abbington gives all the signs of being a great addition after her somewhat stress-ridden introduction in Series Three. And considering how frequently Steven Moffat is accused of not writing well for women, there can be no doubt that together, Moffat and Gatiss are at least continually trying to be on the right side of history and social evolution, with both the Holmes brothers declaring the war for suffrage, for respect and for the societal equality of women, which many would argue has yet to be successfully concluded (In 2015 for instance, the Women’s Equality Party was formed in the UK on precisely that premise), to be the war which much be lost by the forces of patriarchy and paternalism. If you really wanted to, you could see The Abominable Bride as a feminist polemic written by one straight man and one gay man in the 21st century, through the medium of a gothic detective story about a male genius. It’s also a look into Sherlock’s heart of darkness, of fear, of failure personified as Moriarty. And as well as both of those things, it is the best of both worlds – Victorian Sherlock as a way of taking modern-day Sherlock forward and preparing the audience for the show’s return with a hint of what’s to come. Geeks will argue over which side of a coin is really up, so when it comes to deciding their favourite festive TV moment of 2015 (with a smidgen of 2016 thrown in), the odds of reaching agreement are massively long. Some loved the froth-fest of Christmas Who for its simplicity of purpose (make ’em laugh and put a nail in River’s coffin), some will argue in favour of the noirfest that was And Then There Were None. Still others will eventually argue for Dickensian, although by no means yet – it still has half a lifetime to go before it reaches any kind of conclusion). And more still will argue that the final stake through the heart of Downton Abbey was more significant than anything else on television this holiday season. While mostly agreeing with the Downton-slayers, for me, if I had to choose one to go back and watch time and time and time again, there’s only one real contender, and it’s festive Sherlock all the way, for its combination of elements, and for being all things to all viewers. Now – roll on Series Four.